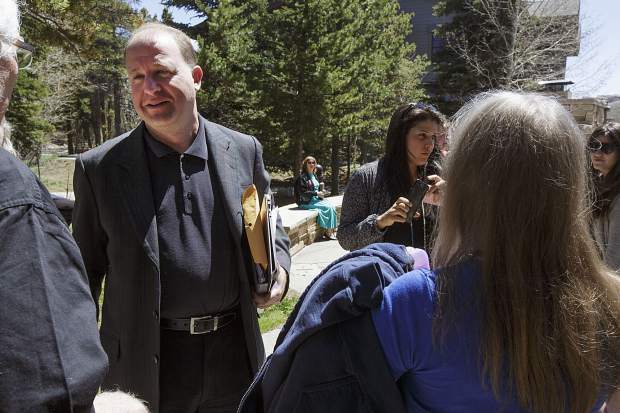 U.S. Rep. Jared Polis, D-Colo., speaks after a May town hall meeting in Silverthorne. Polis has contributed $1,500 to three Greeley City Council candidates. Congressman Jared Polis joined a crowded field in the governor’s race last week, offering up a vision for Colorado that the Boulder Democrat says transcends partisan acrimony and would bring the disruptive approach to governing that he honed in his years as an internet startup founder. The fifth-term U.S. Representative, whose district includes Summit County, has built his platform on three primary goals: getting Colorado to use 100 percent renewable energy by 2040; delivering free, universal preschool or kindergarten for children across the state; and encouraging businesses to offer stock options to employees. In an interview with the Summit Daily, Polis said those concrete ideas are what separate him from the pack, which already includes his House colleague, Ed Perlmutter, as well as three other Democrats and four Republicans. “No one was talking about the big ideas that will take our state into the future until I entered the race,” he said. In addition to those ideas, Polis will also be bringing a hefty war chest to the race, having amassed over the years a sizeable personal fortune that ranks him among the wealthiest members of Congress. His net worth has recently been estimated at $90 million, and it all started with his first of several tech companies, American Information Systems, which he started while still in college. “I founded several businesses, created hundreds of jobs, and that’s a skillset voters like to see in a governor,” he said. In all of those companies, he said, employees were offered stock options, which allowed them share in the value that was created when they were sold or went public. Polis said he would use his position as governor to encourage more companies to do the same and remove barriers that prevent them from doing so. Polis largely eschews partisanship when pitching his ideas, which he says can incorporate ideas from both sides of the ideological divide. That strategy reflects the high-wire act that Colorado politics can be, where a fairly even split of Democrats and Republicans can necessitate governing toward the center. As an example, he cites deeply red states like Oklahoma that already have access to universal preschool. His ambitious goal to get Colorado to 100 percent renewables by 2040 does begin to tread into more partisan territory, although Polis says that the rising fortunes of wind and solar combined with malaise in the coal industry mean it makes simple economic sense. “It’s really about when we get there and what the plan is at the state level to get us there sooner rather than later,” he said. For the next year-and-a-half, Polis will be juggling his campaign with continued duties in the House, where he said he intends to hold the line against Republican efforts to repeal and replace the Affordable Care Act. As far as how he might tackle limited access to care and high costs, particularly in rural counties like Summit, Polis said that would largely depend on the future of the ACA — and what might take its place.